Home » Summer Festivities and 4th of July Celebration! It’s Indepence Day Weekend! That means – picnics in the parks, concerts under the open sky, fun fairs, mouthwatering barbecue festivals, family reunions and, of course, Fireworks! 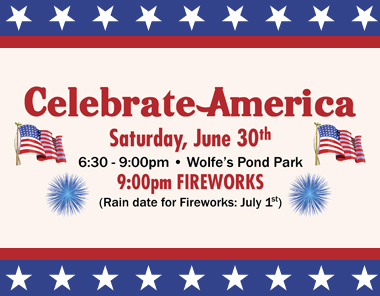 Borough President James P. Molinaro will host his annual “Celebrate America” concert at Wolfes Pond Park. The Concert will feature great music, food, toy vendors, and a fireworks display. Concert-goers are advised to bring lawn chairs and blankets. For more information call 718-816-2133. Join the Alice Austen House Museum for their annual 4th of July event including a concert, free snacks and fireworks! Performance by Staten Island Philharmonic’s. For more information call (718)816-4506. Where: Alice Austen House Museum; 2 Hylan Blvd. Come dance the night away under the stars at the South Beach Gazebo! When: June 29th, Fri. 6:30 – 8:30 PM. Where: South Beach Gazebo, Sand Lane and Capadanno Blvd. Join Staten Island OutLOUD’s annual reading from the Declaration of Independence, plus other historic texts and poetry at The Conference House. Here’s your chance to read our nation’s founding document and related literature, and engage in a dialogue with neighbors whom you might otherwise not have a chance to meet. Where: The Conference House, 298 Satterlee St. at Hylan Blvd. Then on Sunday, the annual reading moves to Fort Wadsworth with a few surprises. Co-hosted by poet Victoria Hamilton, Dean Thompson and Doris Nielsen. Gather at the scenic Harbor Overlook at Fort Wadsworth. If it rains there’s going to be a comfortable indoor location. Enter through the Guard Station at Bay St & School Road (near the Verrazano Bridge). Free parking in the Visitors Center parking lot; follow the sidewalk to the Harbor Overlook. Don’t forget to stop by the Boardwalk Grille and Scoops for an all-American summertime menu featuring hotdogs, nachos, cheese fries, soft serve ice cream, ice cream sodas, and fruit smoothies. Or relax and enjoy a delectable dinner of steaks, seafood, and cocktails at the South Fin Grill. For more information or to volunteer to be part of the festival please email kimberly(at)iophospitality(dotted)com or call (888) 275-7370. This event repeats every week on Wednesday between 6/27/2012 and 8/29/2012. Bike New York is continuing to provide bike education with their popular “Bike With Us” program in Midland Beach this summer! Bike With Us takes children on scenic bike rides through Staten Island after teaching them basic biking skills and safety information. The perfect FREE summertime activity for Staten Island kids, Bike With Us started with 250 kids in their 2009 program and grew to over 1000 kids in last year’s program. Bike New York will be offering its fun and popular “Bike With Us” biking program to kids ages 9 years and up. The program teaches children, in groups of 12, basic biking skills and bike safety information. Once mastering these biking techniques, groups are taken for scenic bike rides in Midland Beach and Staten Island’s beautiful Parks and Greenways. Bikes, helmets, and instructors are all provided. Parents can sign their kids up for one of Bike New York’s two-hour time slots, which will be their child’s session each week for the entire summer. Sessions are offered on Tuesdays and Thursdays; available time slots are from: 10:00 AM to 12:00 PM, 12:30 to 2:30 PM, and 3:00 to 5:00 PM. A free program, “Bike With Us” is an exciting and informative summertime activity for kids whether they’re newbies or experienced riders. Also check out the schedule for 2012 Summer Events on Staten Island! Enjoy and Celebrate This Weekend! Let the Good Times Roll!